Independent UN human rights experts are praising business leaders who have decided to pull out of a high-level investment conference taking place next week in the Saudi capital, Riyadh, over concern for the fate of dissident Saudi journalist, Jamal Khashoggi. Among those who have reportedly pulled out, are the HSBC banking group, ride-share giant Uber, and the International Monetary Fund (IMF). Around 30 delegates and firms are said to have withdrawn from the event. The US Treasury Secretary, and UK International Trade Secretary, have also said they will not be going, though many business sponsors and other companies are still scheduled to attend. Mr. Khashoggi was last seen on 2 October, entering the Saudi Consulate in Istanbul, and there is no evidence that he ever left the building. Other UN rights experts demanded a probe into Mr. Khashoggi's case earlier this week, and the UN High Commissioner for Human Rights has pressed the Saudi Arabian and Turkish governments to ensure that a prompt, thorough, effective, impartial and transparent investigation takes place. The Working Group on Business and Human Rights presented a report to the UN General Assembly earlier this week, which highlighted practical steps businesses need to take to avoid eroding human rights. These principles are echoed in this year’s United Nations Forum on Business and Human Rights, and the United Nations Guiding Principles on Business and Human Rights. 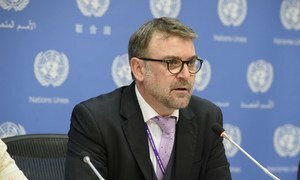 The case of Saudi dissident journalist Jamal Khashoggi is just the latest example of a “new and very worrying practice” of States abducting individuals beyond their own borders, said the Chair of the UN Working Group on Enforced Disappearances, addressing the UN General Assembly on Thursday. 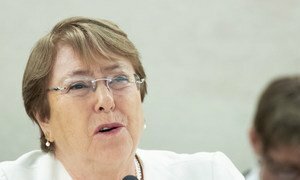 United Nations human rights chief Michele Bachelet said on Wednesday that she was open to an independent, UN-led investigation into the fate of Saudi journalist Jamal Khashoggi, if joint efforts by Turkey and Saudi Arabia, fail to uncover the facts.